The Safe Car Wash app was launched by the Church of England's anti-slavery arm, the Clewer Initiative, and the Catholic Church last year. The Home Office estimates there are more than 10,000 victims of human slavery in the UK - people being forced to work for little or no pay in a variety of industries. One area where exploitation is thought to be widespread is hand car washes. 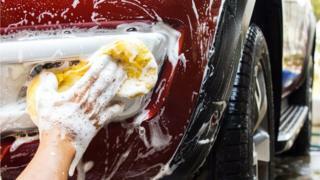 The National Crime Agency, which is supporting the app, said hand car washes were a high-risk business for exploitation, and the report into the results of the Church's mobile phone app gave a further insight into the problem. "If it was busy it was non-stop work. No breaks from 8 o'clock in the morning until 6:30 in the evening," says Stefan, who came to the UK from Romania and ended up working outdoors, in all weathers, at a hand car wash in the North West of England. Stefan is not his real name. He was rescued by anti-Slavery charity, the Medaille Trust after being exploited for months on end. "The conditions were hard because there was no safety equipment. At the end of the day your hands were really damaged because of the chemicals and the soap." He says he was bullied and told he would not be paid if he did a bad job. "I work at this car wash for three months and at this car wash I got £300." Bishop Alistair Redfern, who heads up the Clewer Initiative, said: "They recruit people who've got mental health issues, broken relationships, come from another culture where they don't trust the police, they may have immigration issues. "The only signs are if we notice how somebody looks, their demeanour and then we can begin to push back. "The police can't do that, the local authority can't and health and safety can't. The public can." But the report into the scheme's first few months concludes only 18% of people followed advice to call the slavery hotline, which is triggered when users highlight enough signs of human trafficking. Mick Duthie, a former senior detective with the Metropolitan Police now working with the Catholic Church's anti slavery unit, said that may change. "I think it's a relatively new crime for people to understand," he said. "People from a faith background want to do the right thing but may not have full confidence in what to actually do. So I think the app is great start." Bishop Alastair Redfern agreed it was good that even this many people had called in their concerns. "In our success-orientated world you might think why isn't it 80 or 90%? This is a time of great cultural change really, I think 18% in that culture is good. "I think we need to build on it and say 'because I care for my brothers and sisters who may be suffering, I'll risk pressing the button'." The Kent and East Sussex Serious Crime Directorate said it thought the app was a useful tool against the slavery trade. It was able to identify three car washes it did not previously know about that showed potential signs of modern slavery and human trafficking. Paul Elms, Head of Prevention for the Gangmasters and Labour Abuse Authority, said he thought the app was superb because it gave the user the ability to make referrals directly, but kept them safe as they did not have to confront anyone. He said the app pinpointing the location of each report was enabling authorities to get a detailed picture of the location of car washes across the country.